Aside from news of Stellar Foundation acquiring Chain, a San Francisco blockchain start up for a figure believed to be above $40 million, Litecoin developers are back. This time, they have plans of launching a web based Litecoin wallet that will be secure enough to fend off attackers. Though positive, these two didn’t change the market trajectory and instead sellers are dominant printing new lows in Cardano (ADA). 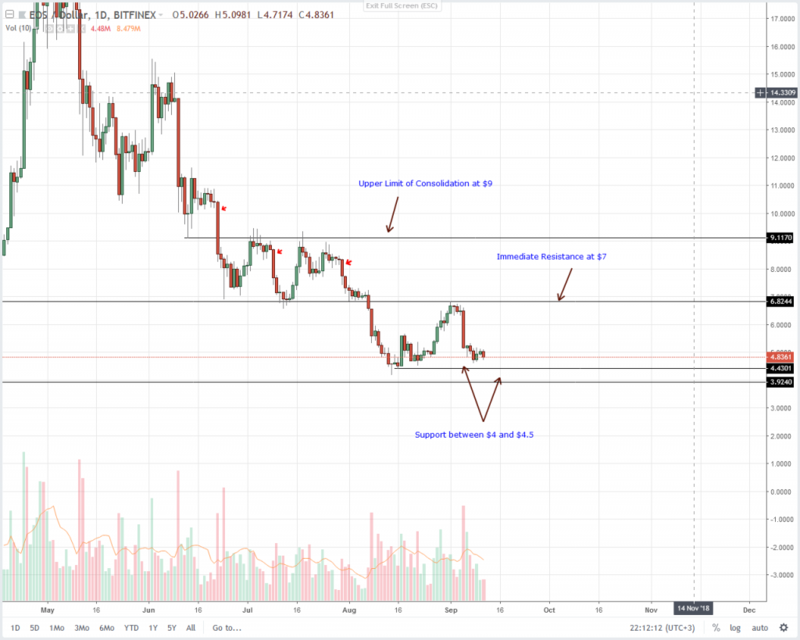 Oscillating between $5.5 on the upside and $4.5 support, EOS is obviously trading within a very tight trade range. Unless there is an influx of buyers lifting prices above $5.5 and $7 or Sep 5 highs, we retain a bearish stand as we trade in line with yesterday’s EOS trade plan. After all, yesterday’s five percent drop did nothing but cap gains bending prices according to the sell trend set in motion by Sep 5 rejection of higher highs. Going by this development, aggressive traders can add to their shorts at spot price while conservative traders can wait for a conclusive, high volume break and close below our main support zone at $4. 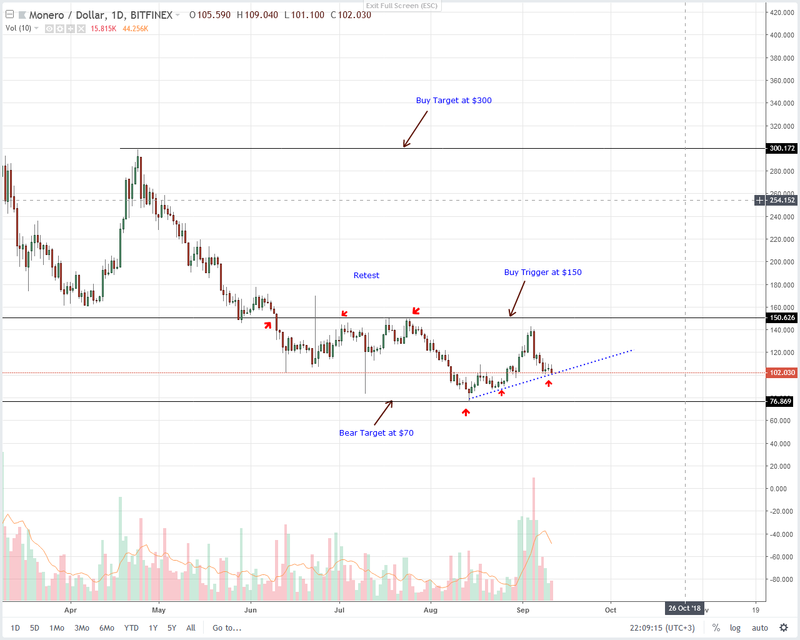 Targets are constant at $1.5 as highlighted in yesterday’s EOS price analysis. By dropping three percent in the last day, not only are sellers gravitating towards $50 trigger line but with every decline–the trend resumption phase confirming early Aug bear break out pattern, becomes solid. From yesterday’s preview, our recommendation was to take a neutral to bearish stand only initiating sell trades once we see a high volume, bear candlestick breaking and closing below the $50 minor support line. At the moment, taking short traders at current prices isn’t favorable from a risk reward point of view. 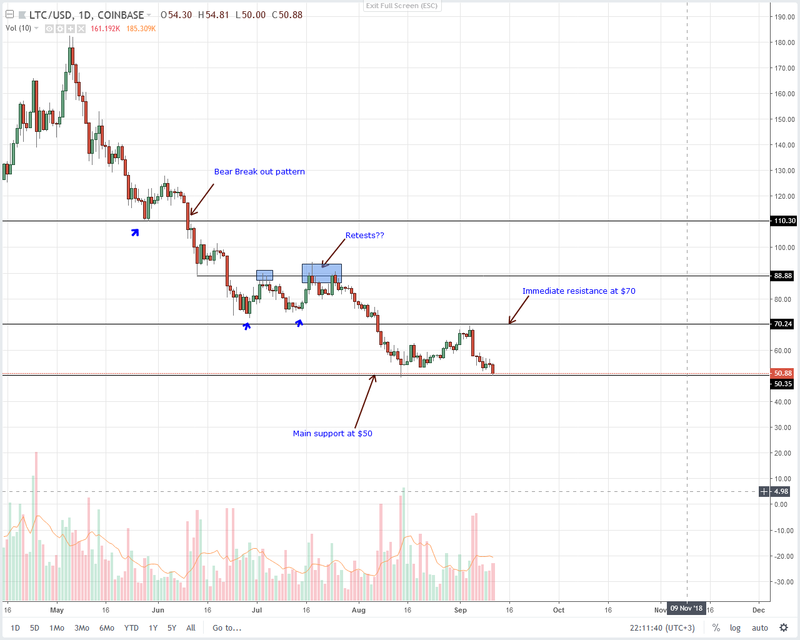 Besides, $50 is an important level marking Aug 2018 lows and prices might react at this level. Chain, a San Francisco blockchain start up, has been acquired by Stellar Foundation for an undisclosed amount though to be in excess of $40 million in cash. According to people familiar with the matter, the deal was concluded on Sep 5 and the new merger—InterStellar will be headed by Chain CEO, Adam Ludwin with Jed MacCaleb acting as project CTO. Relative to recent movements, Stellar Lumens (XLM) is literally flying right. Prices are up five percent in the last day but still today could see further gains. Though our previous trade plans holds true despite yesterday XLM gains, we recommend exiting shorts position because yesterday’s bull momentum could spill over to today. After all, we now have a nice three bar reversal pattern printing at around 2018 lows meaning odds of confirmation is pretty high. Regardless, we shall only recommend buys only when prices print above 25 cents. 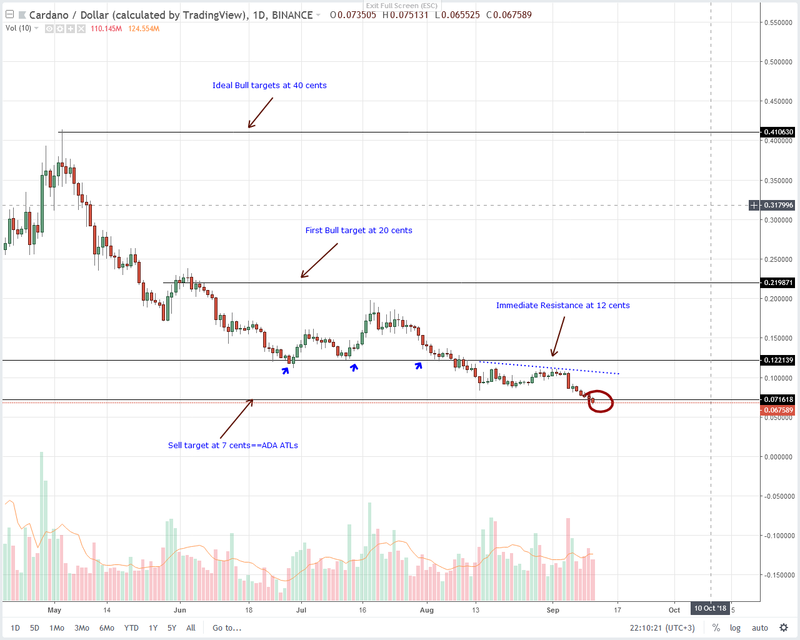 By shedding eight percent in the last 24 hours, Cardano (ADA) did print new record lows. This, according to our last ADA trade plans, means a close below a critical support line and ADA’s ATLs at 7 cents and a probable trigger of a new wave of sellers driving prices lower. Our trade recommendation in light of this event is simple and straight forward: sell at spot rates with stops at around 8 cents. For those who did sell after Sep 5, they can lock in some profits and let the trade run till firm evidence of a bottom prints. Odds are we might see a break below the minor support trend line at around $100 that will ultimately see prices edging towards $70, our main support line and bear target as spelled out in our last trade plan. Evidently, like all coins under our preview, the path of least resistance is southwards and Monero though boosting of superior fundamentals as well as features is tagging alone shedding two percent in the last day. Our opinion is simple, sell at spot price with stops at $110 and target $70 or lower in the coming days. A more cautious approach will be to initiate sells once there is a break below $100 and support trend line today. Afterwards, sells should be executed on every high in lower time frames. 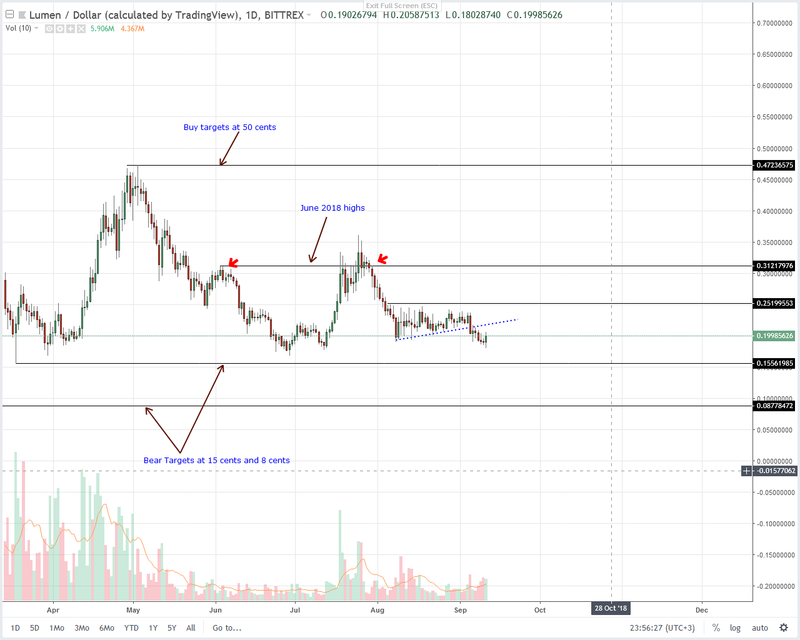 The post Litecoin, Stellar Lumens, EOS, Cardano, Monero Price Analysis: Sellers on Overdrive, But Stellar Lumens Gains Could Slow Price Erosion appeared first on NewsBTC.